I originally received this recipe from an attachment parenting group. I do not know where the original poster found the recipe. 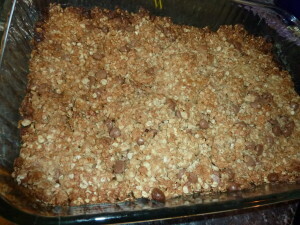 It is a family favorite; even my super-picky husband loves these and routinely asks for them! I’ve added two ways you can use the basic recipe to make different types of bars, but the possibilities are really endless! Preheat your oven to 350 degrees and generously grease a 9-by-13-inch baking pan. In a large bowl, mix all the dry ingredients (oatmeal, brown sugar, wheat germ, honey, salt, and any dry add-ins). Make a well in the center and add the wet ingredients (honey, oil, egg, and wet add-ins). Pour into the prepared baking dish. Pat the mixture evenly into the pan. Bake for 30 to 35 minutes, until they begin to brown slightly at the edges. Cool for 5 minutes and then cut into bars. You want to cut them when they are warm, or they will be too hard to cut! When they are fully cooled, you can store them in snack baggies for a “grab and go” snack. They keep well in the fridge. Laura blogs about her adventures in parenting a Herd of small children, being married to her engineer husband and life in the ‘burbs at WaldenMommy: Life Behind the Red Front Door. She can be found on Facebook at Slaying Dragons.